Jack Horner discovered that dinosaurs cared for their young, and some were social animals nesting in colonies. A paleontologist, he specializes in researching dinosaur behavior and growth; he has accumulated evidence that many named species of dinosaur are actually immature versions of other dinosaur species: he believes up to a third of named dinosaur species could ‘disappear’ when the area is fully researched. His research is now focused on reactivating dormant dinosaur DNA in birds to hatch modern-day dinosaurs. Horner’s face is familiar to millions from his appearances in many television documentaries about dinosaurs. John R. Horner was born on June 15, 1946 in Shelby, Montana, USA. His mother was Miriam Whitted, from Virginia, and his father was John Horner, a Montanan. His father left the Navy when World War 2 finished in 1945 and started gravel business on the Marias River. Father and son shared the first name John so, to make life easier, the son became Jack. The newly born Jack Horner spent his first months living in a tent by the river. As the gravel business began to prosper, the family moved to a house on a hillside. School was difficult for Jack, who suffered from undiagnosed dyslexia, making reading and writing difficult. At age eight he found his first dinosaur bone while fossil-hunting with his father. Hunting for dinosaur fossils became a passion for Jack, and his mother took him on frequent searches. He graduated from high school with low marks – his English teacher told him he never wanted to see him again. Jack never did see his English teacher again, but playfully sent him a copy of his first book when it was published. Despite his difficulties with reading and writing, Jack won high school science fair prizes because he had enormous enthusiasm for practical science. His senior project, comparing dinosaur fossils from Montana with Alberta wowed the judge so much that he asked Jack if he would like to study geology at Montana State University – the judge was a professor of geology there. So, in 1964 Jack enrolled for a geology degree. University went badly and in 1966 Horner was drafted into the Marines, becoming a special forces operative in Vietnam. There he witnessed atrocities and tried to relieve the tensions of war by polishing a mirror for a telescope he hoped to finish building on his return to America. In 1968 Horner returned to America. After dropping out of astrophysics at Caltech he returned to the University of Montana to study geology. He did not complete his degree, but did manage to write a geology/paleontology themed thesis which produced three published academic papers. He left the University of Montana in 1973 and drove trucks for a while. Weekends were reserved for his passion – hunting for dinosaur fossils. While making a living driving trucks, Horner never abandoned his dream of becoming a paleontologist. He wrote to a large number of museums, and in 1975 he landed his first paid scientific work – a technician’s job at Princeton University’s Natural History Museum. In 1976 Horner’s dyslexia was diagnosed allowing him, age 30, to finally understand why he found reading and writing so difficult. In 1977 he was promoted to research assistant at Princeton’s Museum. Marion Brandvold had a rock shop in Bynum, Montana. Horner, who was doing field-work in Montana with his research partner Bob Makela, visited her shop to identify interesting bones she had found. Horner was shown tiny bone parts. He identified these as a baby duck-billed dinosaur – the smallest he had ever seen. Brandvold showed him more bones and the site they came from. Horner excavated the site, finding parts of 15 dinosaur babies. it described a new dinosaur genus, which Horner named Maiasaura and a new species Maiasaura peeblesorum. it established Horner as a well-known professional paleontologist, despite the fact he did not have a degree. A model of a Maiasaura nest in London’s Natural History Museum. In 1980 Horner was awarded National Science Foundation funding for a fossil-hunting expedition close to the site where Marion Brandvold found the first tiny Maiasaura bones. The site was near the small town of Choteau, Montana. evidence that Maiasaura peeblesorum typically laid about 25 eggs in a nest and the hatchlings were about a foot (30 cm) in length. The location of these discoveries is now called Egg Mountain! In 1982 Horner was offered a position at Montana State University’s Museum of the Rockies and returned to live in Montana permanently. Horner’s discovery of dinosaur colonies led him to conclude that many species of dinosaur were sociable and lived in herds. This contrasted with the previous view that dinosaurs lived solitary lives. In his 1993 book The Complete T. Rex, Horner promoted the idea that T. Rex may have been primarily a scavenger. 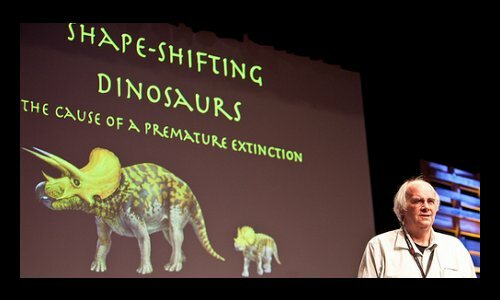 In 1994 Horner continued to promote this idea at the Dino Fest event held at Indiana University, noting that T. Rex would have been very slow moving. Later research by Thomas Holtz and others, however, contradicted this. Although the idea of ‘scavenger T. rex‘ resulted in a lot of media interest, Horner never carried out any serious scientific research in this area. He used the idea to get people thinking more deeply about dinosaur research and to spur interest in the field. Most paleontologists believe T. rex took whatever was on the menu; it would hunt or scavenge according to what was available. Modern interpretation of T. rex, including feathers. Horner ruffled some feathers himself when he suggested T. rex was primarily a scavenger. In the movie Jurassic Park, dinosaurs emerge from extinction when viable DNA is found, allowing scientists to hatch dinosaurs into the modern world. In the real world, Horner has found he cannot recover dinosaurs from ancient DNA, but he believes he can do the next best thing. It is now widely accepted that birds are descended from dinosaurs. When one species evolves into another, the DNA also changes – in fact it is the change in the DNA molecule that causes the species transformation. The parts of the DNA molecule needed for the old species are not necessarily discarded. They may stay in the DNA molecule of the new species, dormant, waiting for a time when they may be called to action again. For example, although birds don’t have teeth, the instructions for making dinosaur teeth are present in bird DNA. This was first reported by Dr. Matthew Harris in 2006. Advances in our ability to manipulate genes and discoveries such as surviving soft tissues of Tyrannosaurus rex have led Horner to believe that a chicken embryo could be grown into an animal that has dinosaur characteristics. Scientists could continue working backwards from this animal, making creatures ever closer to a dinosaur until a real dinosaur could be hatched. If any of this sounds a little familiar, it’s interesting to bear in mind that Horner was the technical consultant for all four Jurassic Park movies released to date. He was also the real-life scientist Dr. Alan Grant was modeled on in the movies. Horner himself makes a cameo appearance in the fourth movie, Jurassic World. 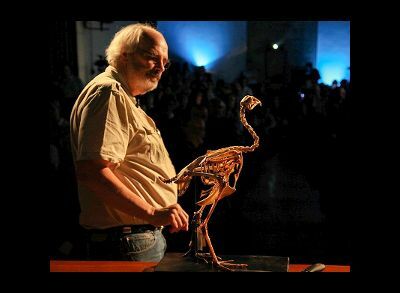 Jack Horner with a bird skeleton. Dinosaur growth, correcting mistakes of the past, juvenile dinosaurs or separate species? Horner is chiefly interested in the behavior and growth of dinosaurs. He believes mistakes have been made in dinosaur classification. He thinks dinosaur fossils once thought of as separate species are in fact fossils of the same species at different stages of maturity. Much of Horner’s work in this field has been in cooperation with paleontologist Mark Goodwin from UC Berkeley Museum of Paleontology. A good example of a dinosaur that may not have existed is the famous dinosaur Triceratops. Horner and his research student John Scannella published convincing evidence in 2010 that Triceratops is actually an immature Torosaurus. Triceratops on the left, Torosaurus on the right. Are they the same species at different stages of growth? Horner’s view is Triceratops is so well-known that its name will stick, while Torosaurus will vanish when the two species are merged into one. Not all paleontologists are convinced, however, that Triceratops and Torosaurus really are the same species: the issue is yet to be finally decided. 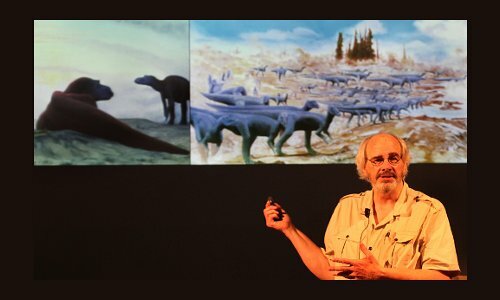 Jack Horner speaking about Triceratops at TEDx Vancouver 2010. Horner believes that up to a third of named dinosaurs will turn out to be other named dinosaurs at different stages of maturity. National Geographic’s Dinosaurs Decoded features Horner and Goodwin talking engagingly about this and also about Chickenosaurus. Horner now teaches as a Presidential Fellow at Chapman University, California. He has one son, Jason, from his marriage to Lee. In 2012 he married Vanessa Shiann Weaver. "Jack Horner." Famous Scientists. famousscientists.org. 26 Sep. 2015. Web. Top photo of Horner, and Horner with bird skeleton by Paolo Sacchi kindly provided by Meet The Media Guru under the Creative Commons Attribution-ShareAlike 2.0 Generic Licence. Shape-Shifting Dinosaurs from TEDx Vancouver 2010 courtesy of Kris Krüg under the Creative Commons Attribution-ShareAlike 2.0 Generic Licence. Triceratops by Dmitry Bogdanov under the Creative Commons Attribution 3.0 Unported license. Torosaurus by Nobu Tamura under the Creative Commons Attribution 3.0 Unported license. 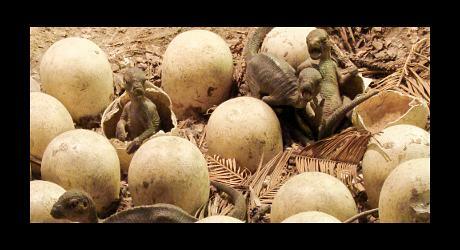 Maiasaura Nest by Drow male under the Creative Commons Attribution-Share Alike 4.0 International license. Tyrannosaurus rex by Matt Martyniuk under the Creative Commons Attribution-Share Alike 3.0 Unported license.